We’re at it again—using our expertise, determined research and wisdom to come up with a new list of the bests. 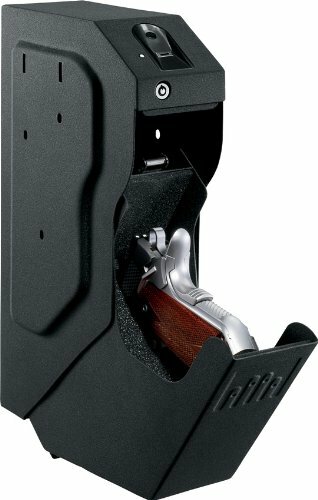 This time we wanted to find the best biometric gun safe. Biometrics are a fantastic technology in the market and it makes sense that they should be incorporated into the world of safe boxes. If you need to protect items, what better way than to lock them into a sturdy metal security box? Still, as with anything that has multiple manufacturers and multiple models, there are some great, good and not-so-good products in the market. This is where we come in! We take our time researching our models to find the absolute best of the best. We really put them to the test. Whatever they are supposed to do, we make sure they do excellently. That’s the only way they make it to our best-of list. With the biometric gun safe, we asked for fantastic security, biometric technology that was reliable, additional entry point capabilities, mounting flexibility and good interior design. 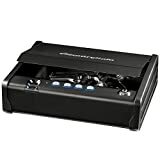 After doing our work, here is the list of best biometric gun safes that we came up with. After looking at numerous designs, we confirmed that the Gunvault SpeedVault SVB500 gun safe is the best one on the market. It has the security features, the durability and the overall build that will help you stay vigilant and protect your home and family. Here are the details about the gun safe and why we chose it as our number one. First of all, the SVB500 is secure. With any vault system, we looked at the overall makeup of the body. What we liked most about this gun safe is its shape. Rather than being a box like our other models, this one is built for ready-to-use retrieval with a gravity-door drop. It’s slim and holds one gun, with the hilt showing first when you open it. This allows for not only easy access, but ease with being ready to use it. When you remove it from the “box”, you have to grab it by the hilt. It’s almost like having someone hand it to you with the muzzle down. By far this design was the most user-friendly if you want to be ready with it. It’s made from 18-gauge steel so you won’t have issues with it ever getting damaged or crushed. The next thing we looked at was the SVB500’s biometric locking system. It has a biometric fingerprint scanner at the top. Again, this is positioned in an easy location, where you can touch the lock with your finger and when you see the green button flash, the door automatically flips open. From there you can easily grab the handle of your firearm and pull it out of the steel safe. The fingerprint scanner can hole up to 120 different fingerprints, so if you want members of your household or family to have access, you can program them in too. The Gunvault Company boasts the lowest rejection rate with their biometrics and we tested them out over and over without any problems. By far this was a huge concern for us because if a user needs their gun, they likely need it an instant. If for any reason the biometric reader doesn’t work, due to dead batteries for example, you can also use the two emergency keys included. We also looked at the overall body of the SVB500. As we said, it’s made from 18-gauge steel. Its construction is sturdy and the fittings are tight, making it virtually impossible to pry with tools. This is a great security feature to keep your weapon safe while in storage. The entire vault weighs just 4.2-pounds, despite its sturdy steel construction. Its dimensions are 6 1/5-inches by 3 ½-inches by 13-inches. We liked the size because it is small enough to mount just about anywhere easily. You can mount it from the right or left, vertically or horizontally. Though the most common configuration is vertical to fully utilize the ready-to-shoot exit of the firearm, it can be changed to alter your space. The interior of the SVB500 is foam for added protection of your firearm. It will lightly rest on the foam and never get damaged or scratched. It takes one 9Volt battery. When the safe is opened, the light comes on and illuminates your way so you can clearly see your firearm immediately. 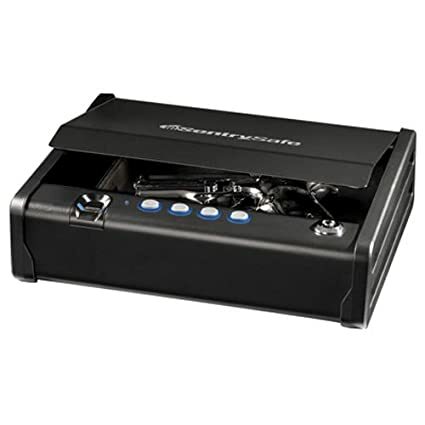 In terms of backups, the safe comes with two backup override keys so you can always get into your box. If for some reason the biometric feature doesn’t work or the batteries wear out, you can still access the vault. The SBV500 is quality-made gun safety. The design is unique and helpful if you need to retrieve your firearm quickly. The biometric feature is a great safety precaution, as is the overall build of the box. At high-weight steel, it isn’t a box that can easily be penetrated. Plus, the fittings offer hair-thin spaces between them, which is far too small for any object to be used to tamper with the box and gain unwanted access. If you are looking for a safe, efficient and secure gun vault, consider this one. It has everything you could ask for in a safe, and more! 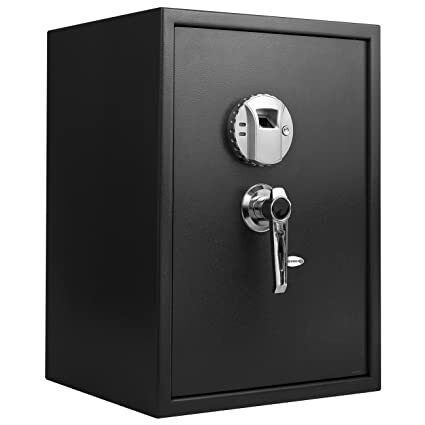 The Sentry Safe is more traditional than our number one pick, in that it is a literal rectangular box. Entry to the box is designed to make no noise with a gas strut entry. This is a helpful tool because if you need your firearm quickly you can retrieve it with no noise whatsoever. Though the box is made of steel, there aren’t any give-a-way signs that you’re getting out your weapon. Plus because the gas strut automatically opens the box when you provide the right access code, you can easily focus on your weapon, and not have to focus on opening, or holding open, the box. Many of the other boxes we looked at opened with creaking sounds or had clanging bolts. This one was silent- not just when it opened, but when its lid was open as far as it could go. Sometimes there is a “click” when the lid hits its maximum position—not with this one. Thankfully. When it comes to entry, the Sentry Safe is built with three ways to enter the safe. One, you can use the key override. Two, you can use the programmable digital keyboard. Three, you can use the biometric fingerprint tool. The biometric reader can be programmed for two different fingerprints. The reader is on the left side of the box, so you theoretically can gain entry and pull out your firearm with your right hand. This gives you fast-retrieval so you can be ready should an intruder necessitate immediate access for protection. Another notable feature is the biometric scanner is able to take more than one scan of your finger. This was a handy addition to ensure that when you need access to the vault, you can get it. The digital keyboard is a nice feature also. Should the biometric tool not work, you can still gain access to the vault with the programed button sequence. Finally, having a standard key backup is always a good idea. One feature to be aware of with this safe is that to use the biometric feature, you have to first “wake up” the machine. You can do this by either swiping your finger on the biometric reader and then when the light turns on, using your finger again to access the box. Or you can hit one of the buttons, wait for the light to go on and then use the biometric reader for access. The body of the Sentry Safe gun vault is sturdily made from 12-gauge steel. It has the same security feature of the SVB500 in that its hinges and pieces are tightly constructed to avoid prying it open. This box is 12-pounds, which still is in a very manageable range. Its dimensions are 6.6-inches by 9.7-inches by 2.2-inches. Because it is just 2.2-inches high, we can easily see it stored in discreet locations throughout your home or office space. It also can be wall mounted by purchasing the hardware separately. It uses four AA batteries. The Sentry Safe’s inside is padded. Again- this is a nice feature because it ensures that anything you place in it won’t be damaged or scratched. This also is a pry-resistant safe with quiet hardware. What we liked most about all of our top selections is that they were built for one-handed access. This is a good feature because it allows you to focus on retrieving your weapon, and not managing a clumsy vault. The Sentry Safe is our silver pick because of its security, various means of access and simple design. We loved the fact that try as we might, we couldn’t pry it open and get past any of the security features. If you need a gun safe, this is a great option to check out! Our bronze pick is the BARSKA Large Biometric Safe. This is an all-use safe for more than just a small item. This offers lots of space to protect a wide variety of items. If you need a secure place to keep multiple items out of reach, this is a perfect safe for you. The BARSKA is another safe that is shaped like a box. It’s a little larger than our first two picks, but still if concealing your vault box isn’t an issue, this can definitely serve you well. If you have more to protect behind the sturdy walls of a safe, this may be exactly what you need. There are three shelves within the BARSKA. The lowest one (on the safe floor) is covered in carpet for delicate valuables that may need added protection. What we liked about this model is that it is large enough to hold a lot. You can put a firearm, valuables, and even other small boxes within this large safe. The door is silent, so even though it is large you won’t have to worry about noise should you need access in a situation where silence is paramount. Inside of the BARSKA is also a red programming button. This is a red button on the inside of the door, handily out of the way of valuables or anything you might reach for. You can use this button to program it to silent mode, or to enter up to 120 different fingerprints that will allow the safe to unlock. We liked the safes that allowed for numerous fingerprint readings. This means you can allow access to more than one person at any given time. The biometric feature on the BARSKA is a great tool for security. To use it, you have to press the “wake” button on the right of the biometric reader. Once the light comes on, you can put your finger on the reader and the safe unlocks. Like all good safes though, it comes with other ways to open it. The package includes two keys. One caution though, the keyhole is hidden under the BARSKA metal nameplate at the front. To gain access via the key, you must remove the nameplate (or at least one side of it) to see the keyhole. An Allen wrench is included to do this. Once you remove the plate, you can use the key to unlock the safe. A third way to open it is by using an included battery pack. 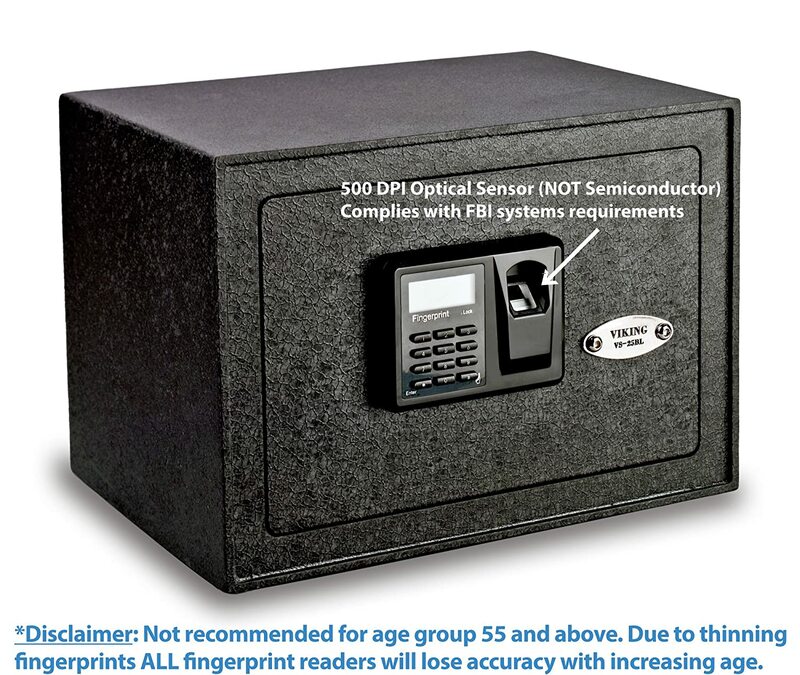 If you connect the battery pack to the biometric reader and press your finger to the reader, it will unlock the safe for you. There is a loud beep when you successfully gain access, but this can be programmed to not sound if needed. This allows you a completely quiet safe. Remember though that with the BARSKA opening the safe is different from unlocking it. Our first two picks allowed you to use both the “unlock” and “open” feature at the same time. This one doesn’t. You have to disengage the lock in one of the three ways noted, and then use the large sturdy handle on the front of the safe to pull the door open. The BARSKA is a hefty safe. It weighs 48 ½-pounds. Its outer dimensions are 15-inches by 20-inches by 14-inches. Its full inner dimensions are 13 ½-inches by 9 ½-inches by 19 ½-inches. We liked the amount of space it offered because this allows it to be a secure spot for a multitude of items including documents, folders, firearms, money or valuables. It also can be mounted via factory pre-drilled anchoring points. It has holes at the back to secure it to a wall, and on the bottom to secure it to the floor. It comes with 4 AA batteries. The BARSKA definitely has a lot to offer in terms of security and sturdiness. We liked it because of its size and ability to keep multiple items safe. If you need a good safe that can hold all of your valuables, consider this one. It is a great product and earned its way to our bronze slot on this list. As usual, we come up with our top three picks on the list of bests but then we nominate one final item as our budget buy. This is the item that possibly didn’t have the same amount of features and characteristics as the others and usually is cheaper, but still performs well and deserves some consideration. In the case of the best biometric gun safe, the budget buy is the Viking Security Safe VS-25BL Biometric Safe Fingerprint safe. The Viking safe is another box-shaped vault. We liked this one because it has a lot of security features for the cost. Like the BARSKA, you can secure multiple items inside. The inside is completely covered with carpeting to protect any valuable that may be delicate, or valuables you want kept in pristine shape while in storage. The safe comes with one shelf that is not only removable, but adjustable to fit your needs. We liked the Viking’s security features of multiple entry points: a 500DPI biometric reader, a keypad and a 4-prong cross key. The biometric reader can hold 30-differnet fingerprints so multiple access is definitely not an issue. Beyond the biometric reader, it also has a full keypad that can hold a customizable PIN number of 4-9 digits long. Pressing the right sequence will unlock the door without the biometric feature. The third way to gain access to the safe is using the included keys. What we liked about the key access is the added attention Viking place in making keys that were difficult to copy. They use 4-prong cross keys, rather than more traditional barrel keys. Though it takes a lot of time and effort, barrel keys can be picked. Four-prong cross keys are much more difficult to fake. They have ridges required to unlock the lock on all four sides of the key- they run on top, bottom, left and right. This makes it very difficult to copy or pick. This definitely was a feature that we loved as an inclusion on this safe. As with the BARSKA though, to gain access to the keyhole, you need to remove the front nameplate, as the keyhole is under it. The Viking safe is also sturdy. Its powder-coated steel frame weighs 26.6-pounds and that makes it easy to move and mount to where ever you need it to go. The outer dimensions are 10-inches by 14-inches by 10-inches. The inside dimensions are 9 ½-inches by 13 ½-inches by 8 ½-inches. It also comes with lock bolts that are sturdier than most safes. Most safes use 16mm bolts on a 2mm door. Viking equipped this safe with 20mm heavy duty motorized deadbolts on a 5mm door. We liked the non-pry mounting features on this safe too. You can easily secure it to the floor, to a wall or to the ceiling. The display was also built to be helpful. It notes each digit of the pin as you hit the corresponding button. It is backlit for easy viewing at night, or in darkness. The LED also tells you when the batteries are running low. The safe beeps if the door is left open. Like the other safes though, the beep can be programmed to the “off” setting if desired. It runs on 4 AA batteries. If you have to change them, the memory is backed up so you won’t have to resubmit your fingerprints or reenter your PIN code to continue to use the vault. Another helpful feature was if the PIN entered is incorrect, the machine institutes a time-out before another number can be entered. Overall, this is a great little safe. It is secure, sturdy and reliable. If you need security for documents, valuables, money or weapons, as a budget buy, this Viking is still a great option. When we embark on a research project for any product, we first come up with the considerations we are going to focus on. Let’s say we are reviewing lawn mowers—our primary concern is “How well does it cut?” The same logic works for all of our products. With the biometric gun safe, we came up with the things that were most important to a valuable safe. Here are the details on the criteria we looked at. We wanted safes that were made durably with no-pry casings. This meant that they had to be made of steel and the seams had to be as tight as possible. We saw a lot of safes that we easily could slip a small screwdriver into and start prying away. These were quickly vetoed from our list. We also found some safes that weren’t able to hold up to hammers or even our kicks. Again- vetoed! We kept the safes comprised of high-quality steel. That means 12- to 18-gauge. We also looked for hardware that was sturdy and would hold up. Sure our safes are meant for indoor use, but they still had to be fire-proof and sprinkler-system proof. The elements can still potentially get to them so we wanted to make sure that they were strong enough to handle it and built to endure. Next we considered the design. Most safes are designed like boxes. Once in a while we have a unique design (as with our number one pick The Gunvault) that stands out for all the right reasons. What we loved about this one was that though it wasn’t the normal box, it offered enough convenience features. The way it popped open with a single finger-touch to the biometric reader, and allowed the user the ability to quickly grab the hilt of their firearm was unchallenged in terms of performance. That’s why it made it to our number one pick. Our other picks are boxes. That definitely isn’t a bad thing. We wanted the safe boxes that were large enough to hold multiple items. 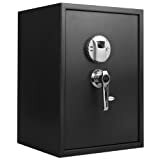 Most people who need safes have money, coins, jewelry, paper/documents and weapons all to be stored securely. This means they need space. We wanted boxes that allowed for that space to be secure. We gave extra points to the manufacturers who included shelving that was adjustable or removable for customer customization. We also looked at where the biometric reader was placed. Some safes we reviewed had biometric capability, but the reader was in an inconvenient place, or hard-to-reach in an instant. We imagined that users would have to gain access quickly. These safes didn’t work for us and were removed from contention early on. We were left with the safes that had their biometrics in a specifically chosen area to serve the purpose of quick access. Next, we looked at the locking system each safe came with. Biometric technology is a wonderful advancement that makes security simple with one-touch entry. We loved the inclusion of this technology in safes. On top of that though, we also looked at the other ways of gaining access to the contents of a vault. Three of our designs included a keypad and lock backup. The keypad allowed for multiple PIN numbers to be entered. The locks were high-security also. On top of the entry points, we also looked at the overall strength of the locking mechanism. Our chosen top four products all had top-of-the-line locking strength for added security. The bolts were strong. The seams were tight. Finally, we looked at the safes with customizable mountings. We wanted safes that could be secured to a wall on either side, a ceiling, or a floor. This was an important feature because, in particular for our smaller safes, they had to not be easily carried off site. One of our options is larger and may be difficult to carry, but our other three options were easy to pick up. This necessitated some method of locking them down to an area via bolts. We wanted this ability to be available with all of our safes. In addition, we wanted users to be able to bolt them down any way they needed—left or right. In particular our number one pick was meant for ease of weapon retrieval. This meant it had to be left- or right-mountable for left-handed and right-handed users. In the end, we came up with the top three biometric gun safes and the bonus buy. We made our products work for their titles and we are happy with the results. You can confidently pick any one and be sure that your items are secured away for you when you need them most.